Figure A. RPE conjugated mouse anti rat CD2 (MCA154PE) and FITC conjugated mouse IgM isotype control (MCA692F). 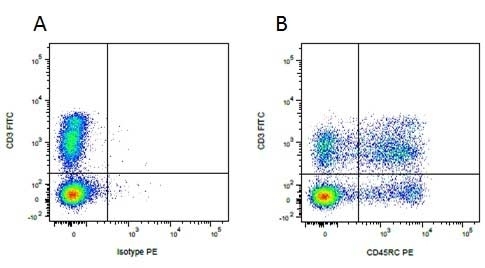 Figure B. RPE conjugated mouse anti rat CD2 (MCA154PE) and FITC conjugated mouse anti rat CD3 (MCA772F). All experiments performed on red cell lysed rat blood gated on mononuclear cells. Mouse IgM isotype control for measurement of non specific binding of mouse monoclonal antibodies. This antibody recognizes a rat surface antigen. Mouse IgM negative control antibody is designed for use as a negative control reagent to assess the level of non-specific binding of mouse IgM monoclonal antibodies to human cells. This antibody recognizes a cell surface protein on rat cells and is therefore not suitable as an isotype control for work on this species. Purified IgM prepared by ammonium sulphate precipitation from tissue culture supernatant. Purified IgM prepared by ammonium sulphate precipiation from tissue culture supernatant. Spleen cells from immunised BALB/c mice were fused with cells of the P3-X63-Ag8.653 mouse myeloma cell line. * We recommend using this reagent at the same concentration as the test reagent.